visit and mail us your own plans together with your projected flight data. We will readily confirm your tour program and dates of arrival/departure so that you can book your flight accordingly. In case of a very individual tour program we will work out the tour price and inform you, asking for your final confirmation. You need not worry about soaring prices in case of individual tour programs because it is one of our strict business rules to keep prices as low as possible. After our final confirmation of your tour program including a possibly added beach hotel holiday you will kindly transfer a deposit of 10% of the costs to our account and the rest of the total amount will be due four weeks before your arrival at Colombo airport or should be handed over to the team member meeting you at the airport. The tour price always includes hotel costs and half board, all entrance fees for places mentioned in the tour program and car as well as driver/guide expenses. In case of major tour rearrangements while travelling it might be necessary for you to cover extra costs for additional entrance fees etc. but we can assure you that this will happen very seldom, so that you can calculate your holiday expenses securely. 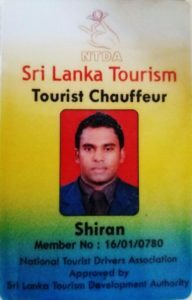 You can be absolutely sure that your Sri Lanka holidays really start at the moment you arrive at Colombo airport, where you will be met by myself or one of my reliant drivers, and we will take you back there in time for your departure when going home. If you add some extra beach holiday time at the end of your tour we can find an arrangement for the additional transportation costs from your hotel to the airport before you finally book the complete Sri Lanka holiday. So, you may altogether relax concerning accommodation and transportation . We will take care of everything you need in Sri Lanka until we say a friendly good bye at Colombo airport. Tel. : +49 (0) 49 41 91720.